Today, there is still more than 1.7 billion adults worldwide who lack access to any sort of formal financial services. Many still transact exclusively in cash and have no safe way to save or invest money. As a result, they lack access to credit beyond informal lenders and their personal networks – something that is especially common across emerging economies. What this does is effectively prevent individuals from engaging in economic activities that could not only transform their lives, but that can also impact economic growth. In recent years, the global money transfer industry has been experiencing major shifts away from the traditional brick-and-mortar model – where people physically went to stores to send and receive cash – towards more digital money transfers and payments, using mobile devices. With the growing adoption of mobile phones now hitting over 5 billion users, and the increasing usage of mobile wallets, the appetite for cross-border money transfers and alternative payment solutions shows no signs of slowing. This is especially prevalent in emerging economies across Sub-Saharan Africa and South Asia where demand for financial services is high, yet the penetration of banking services is low. Having access to digital financial services across emerging economies brings many benefits. What’s more is that using digital channels rather than brick-and-mortar branches dramatically reduces costs for providers and increases convenience for users. Essentially, it opens access to finance for people at all income levels and locations. For businesses, digital payments and digital financial services can erase huge inefficiencies and unlock significant productivity gains. Thunes (previously TransferTo) is a B2B technology service provider that operates a cross-border network and delivers smarter payment solutions for emerging economies. The company has an active global network that reaches over 80 countries with more than 9000 interconnected payout partners and has processed over USD 3 billion in transactions. Thunes aims to leverage technology to disrupt the existing financial system with a mission to help solve one of the world’s more pressing problems – to help make financial services more accessible, and available to everyone. This goal is made possible through the global network that Thunes operates which interconnects diverse payments systems that accept traditional and alternative payment solutions. This enables Mobile Wallet Operators, Corporations, Merchants, Money Transfer Operators, and Banks to facilitate the real-time movement of funds to and from emerging countries. As a result, the unbanked and underbanked populations are offered access to a new type of digital finance and become better connected to actively participate in the global economy. Person– to-Person (P2P) Remittance Processing – Interconnecting financial institutions and digital financial service providers, enabling the seamless movement of funds to and from emerging economies in a fast and secure manner. Corporate Mass Payouts – Businesses can expand their presence to emerging markets while Thunes seamlessly manage their cross-border payments. Opt to pay multiple recipients in different countries using various payment methods and multiple currencies. Digital Payments – Accept alternative payment methods from your customer. 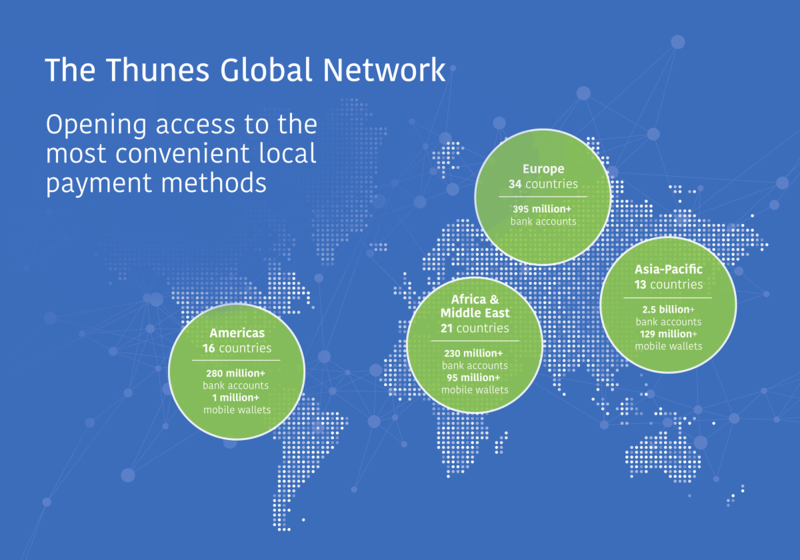 Thunes links digital wallets into its network to make it possible for consumers in emerging economies to have access to alternate payment systems. Partners can connect into the entire Thunes network through a single API connection. The company’s APIs enable real-time transaction processing across the global network with a full suite of services from integration through to reporting. All of which is managed in-house by an experienced tech team. Thunes adheres to a comprehensive compliance program and is an authorised payment institution by the FCA in the UK (License #720167). The company’s compliance program ensures full partner due diligence, transaction and end-user monitoring with detailed activity reporting. Through the company’s innovative technology and extensive global network, partners are able to scale their business globally, reach new markets and enable greater financial access for those that need it most. This lead story was first published in the Money 2020 Asia special edition of Financial IT Magazine. Click HERE to read the story (page 24-26).